“I’m not wanted.” I can say the words and blood, it rushes fast toward face, fills with heat burn. Hot tension, pounding the words into the shame place of flesh. “Not Wanted.” Salt tears sting eyes at the rawness of the thing. Chest tightens. Heart blasting beats to the rhythm of rejection. “Not wanted.” A cut deeper than not liked, not needed, not appreciated. Words that gnarl more than ugly and stupid. To be wanted is to be wished for. A wish come true by just being, as is. It’s the best thing in the world to be wanted. Hoped for. Dreamed of. Which is why being not wanted gouges into flesh and leaves us immobile and self loathing. It’s as if we decide to take up the rejection, right along with the one who doesn’t want me. I don’t want me either. The place where self hate, cutting, shooting up, hiding, and suicide resides. Not all self loathing and suicide of course, but some. “Not wanted.” We’re ok to say it to each other in rather benign ways. “I need my space.” “No offense, it’s just that you’re not my type.” “Let’s ditch um, we could use a break.” Sometimes we call it self-care, sometimes boundaries, when really what is being acted out is rejection and walls. We invite people to our celebrations that make us larger than life, and if we are honest, we will admit to ourselves that the people on the fringes of our lives are not wanted. I don’t want them, and neither do you. And when I’m on the fridge, holding on best I can, but my dignity has gone in exchange for just getting through another day, I don’t want me either. The idea of being wanted is most strongly associated with a discussion about family planning. Wanting. Wanting a baby. Choosing. And how much choosing do we really do, in our wanting. At the mercy, we are, of what arrives. And then if what has come is not what we want, distance is served. Pain is felt down to the marrow, and lasts a lifetime. Felt by the one who wanted and and was left wanting, and by the one who arrives but has not adequately filled the order. Wants a boy and gets a girl. Wants a violin player and gets a cement man. Wants a cowgirl and gets a princess. Wants a live baby to hold and instead has to hand off, already gone away to Heaven. Belonging and being desired is such at the core of our being, that when we aren’t we crack. Then why do we do it to each other? Give a cold shoulder. Sneer. Shame. Do all we can to let others know they aren’t wanted. Kids do it naturally. “Kids are mean”, we say, and it’s true. So quite naturally we become rejectors. And God shows us another way. He shows us what it’s like to feel planned for, sought out, wanted, desired. Created special for a purpose. To be seen and treasured. If I don’t want you just right, God does. I want to want you, beautiful you. Want to want your company. Want to desire your friendship. Want to love your presence. Even when I can’t always feel these ways towards you because I’m a broken human, I ask God to use my friendship with you to give you the gift of wanted. I matter to God, no matter how you treat me, and so do you. And want you to feel it. Wanted. Forever. Just what is wished for. Just right. Settled. Love-breath upon wished-for heart. Just right. And I settle into a love for rejecting you, as I know what it is to be limited in my abilities to want. The safety officer has arrived, I see. Rejection names. Names given to a person finally able to speak the truth of a thing, unable to pretend anymore. The name given to the one who says: Enough! Here is what the word means according to www.dictonry.com and Merriam-Webster. 1. to attack or treat with ridicule, contempt, or derision. 2. to ridicule by mimicry of action or speech; mimic derisively. 3. to mimic, imitate, or counterfeit. 4. to challenge; defy: His actions mock convention. 5. to deceive, delude, or disappoint. 6. to use ridicule or derision; scoff; jeer (often followed by at). 7. a contemptuous or derisive imitative action or speech; mockery or derision. It’s obvious that mocking is an attack using ridicule towards someone. Most, however, do not realize that built into the definition of the word mock is “to deceive”. That is exactly what happens when we mock. The reason a person mocks is to fake out the one they mock. The lie takes the attention off what should be heard or acknowledged or noticed. Minimizing what one has done or said that is worth respectfully acknowledging. It is a behavior for the avoidance of truthful discussion. To harm another when I don’t like what you’re doing, or what you’re saying. Rather than allow you to be who are are, and notice what you’ve noticed, or listen as you speak of what bothers you, in my discomfort I tell a lie by not honestly stating “I’m uncomfortable. I’m afraid. I’m ashamed when you talk about this, or do that.” So rather than tell the truth, we make the choice to lie-mock. Mocking does what it’s intended to do. It shuts the mocked one down from doing. From being. From noticing what needs noticing. From saying what should be said. If only the mocked one would remember that to be mocked is to be lied to. The shame words might have less power. We might take courage and do what needs done, despite disgust and disdain, because we know that the mock-lies are weak strands that hold back only those who will be chained by cover-ups. Once in awhile I do something just right. The Mom job has left me with a steady drip, drip, drip of ‘what were you thinking, anyway? !’, so when I happen upon the rare ‘atta-boy’ for my parenting, I accept it. Today as my 7 year old loaded toy after special toy into a Trader Joe’s paper bag, to the top and overflowing, it dawned on me that Butterfly is the last of our 4 kids to have passed the “am a share-er of nice and special things, am not a hoarder’ test. As hoarding seems to run in parts of the family, it was one test I hoped they all would pass. The kids have been natural savers of every little thing. Ticket stubs from a special play, a glass bottle from an unusual soda, shells and stones and really cool pieces of wood. Might hoarding take root when I force my child to get rid of a thing? might I create fear and an unhealthy protection over his or her things? Would it help to have my child pack up some items temporarily (for the attic), as a way to teach them to practice parting with something special for good? With these questions in mind, when it came time to clean a bedroom or toy room heaped high with too much stuff, I’d ask the kids which toys they wanted to keep in their rooms, which they wanted to pack away for another time, and which toys they wanted to give away. First time around always took more time, they were little and putting a special toy into a box to be put away worried them… but I let them do this choosing and packing while supporting them. Packing for the attic became familiar over time. As each child learned that the things they had chosen to store in the attic could be retrieved again, the fear of packing up treasures faded. I had to release my need for an instant minimalist home and attic. hopes that my kids would mature into open-handed individuals. The ideas above were important, but most importantly, when son or daughter wanted to give something away, I tried to never argue about what he or she wanted to part with. I didn’t always do this perfectly. Sometimes I didn’t like the idea of losing an expensive toy or book, special for whatever reason. But I decided if I couldn’t bear to see a thing parted with, how would I ever expect my kids to learn what I was trying to teach. Hoarders aren’t just junk collectors who don’t like to clean. They sometimes extend kindness to an unwanted object, as if the thing were were a person. Finding value in something that is about to be tossed. Finding value and thinking themselves clever for having rescued it. They also self sooth their own anxiety by saving an object, experience a feeling of relief and security holding onto a thing. Difficulty with decision making can be part of the equation. The more hoarding that takes place, the more difficult decision making becomes. Some hoarders have a bit of maverick in them. A bit of ‘ain’t nobody gonna tell me what to do. I ain’t beholden to nobody.’ Owning things, a way to avoid buying or borrowing from another person, living in the fantasy of complete independence. Hoarding is no worse a break from the best than overeating or yelling at my kids. It is, however, very debilitating and very isolating. And is also somewhat socially acceptable. We Americans in 2016 love our junk. I don’t want that for my life, and don’t want that for my kids. Objects are not able to provide what we really need. We spend time dreaming and saving and buying the most recent really cool thing, telling our friends what we hope to buy one day, telling them what we have. And while we are consumed with our things, we miss it all. Miss another catching our eye. Stop reaching for the hand beside us, there to hold. The hair for tousling. I want my kids to realize that some of the nastiest thieves in life are really cool things. Things are not people, do not carry feeling, and can not meet our deepest needs. Surrounded by excess I forget to ask, am I comfortable? My family, are they comfortable? much of what is special to us would have to go. When a thing takes away from living life, it’s time to give it away to someone who will experience more blessing than curse. I want my children to realize that even a thing with possible future value, something that might be used one day, if taking space in heart and home is a thing that holds more power than it should. As I’m coming off of three years of being sick, house budging to the brim, finally able to load up bag after bag, Butterfly and Mr. All Business at my side, I’m thankful for what I part with. Husband, children, Lincoln the dog and myself in this house, all more valuable than its contents. Extra items, they gasp and choke out a full breath of life. Away, you choking items of ownership! Come near, hands to hold, blond curls, happy paws. And together we carve out spaces of togetherness. A special mop has come into my life. Such happiness. A mop able to bolt me out of bed, race me toward kitchen floor for one more scrubbing. Fan turned to high to erase all evidence before giant feet, medium sized feet, little feet and a pair of paws arrive for one more day of mess making. Granted, this mop has special powers. It comes with built in bucket elongated the length of the handle, a tank of mixture (oxiclean,bleach and water). No need to fill a sink for dipping mop into. I have a mop camelback of sorts, with a squirt function just above the mop pad which, by the way is velcro like, and removable! I hate a sticky floor, and for some reason I have never been able to keep it straight for any length of time. My reasons are many. Good reasons such as our kids are hungry 75 times a day rather than the mythical 3. Lets see. There’s the tap shoes that can be used only on the tile, and don’t you realize that floor tapping is so much more fun while using the hula hoop that accidently crashes into the dogs dish! Just when I’m asking a certain Little Miss to clean it up, the doorbell rings and her long lost neighbor who she hasn’t seen for 3 whole days is bouncing up and down screaming right along her in celebration of finally seeing each other again. How can I ever stop such sheer happiness, and so I lean down to scoop up dog food while below in the yard they are bounding, racing, jabbering just because they’re together. In the middle of that task I think to myself, I’d better mop, too. Heading to the pantry where I keep the mop, I remember a niece in bootcamp I haven’t written to in a week or two, and I know if I don’t stop everything I’m doing right now and get it done, it won’t happen for months. Sitting down at kitchen table, I tell her about swim team for one cousin. The fish he caught on vacation. The lawn mowing business he works at. I tell her about another cousin of hers working at Olive Garden, singing Gershwin with me last night, just for the fun. Tell her of the adventures of Little Miss. Forts built, the cooking, the reading skills she’s acquiring. I tell her tales of work life at Boeing for Uncle. The walks I take with clients. Address on envelope, stamp intact, I better take this to box or it will never be sent. Oh no, it’s time to feed the kids again. And so it goes, until the whole day through is consumed with ways of ruining my floor. Happy sticky floors. By time the mess makers of all sizes are tucked into bed I can hardly take a step. But try, I do, to sweep and mop, for starting tomorrow out really nice, with feet bare stepping across unscathed soft surface. And as I stirr early morning, house mostly quiet but for husbands noising sleep-breathing, a ticking clock beside my bed, I just can’t help myself. Makes not a bit of sense at all. The floors have not been touched since I mopped them last. Still, I think one more sweep and mop will do no harm toward the cause. Stealthy sneaking out of cotton sheets, through bedroom door, down the stairs to kitchen floor, I sweep and mop, frizzled hair a-flying, fast I work. The last edge swiped up, the fan now on, I hear feet on the floor. It will be dry by the time toes arrive. Yeah!!! I did it. Chapel uniforms have been the same four years in a row for our school kids. For some reason I can not ever remember what they are. Navy and kaki, white and kaki, or the burgundy and navy. Humm… maybe it’s the navy with the white. Well, year book came home with the kids yesterday. Oh dear, picture after picture. Ribs started aching at the outlandish hilarity of what we were seeing. Butterfly – the only little Pre-K’er wearing a kaki jumper and white blouse under, kind of the centerpiece angel, surrounded by her entire class wearing burgundy and navy. All Mr. Business in his class picture wearing a burgundy shirt and navy pants… color was right amazingly, but the only one without a vest. Another picture – there she goes… Butterfly running for the fund raiser, rainbow striped shirt and hot pink pants, the rest of her class behind and before wearing the burgundy spirit-wear. For Mom’s Day at school a month or so ago, All Mr. Business asked me what my most embarrassing moment ever in my life was. After listening to my story, I asked him about his most embarrassing ever in his life moment. 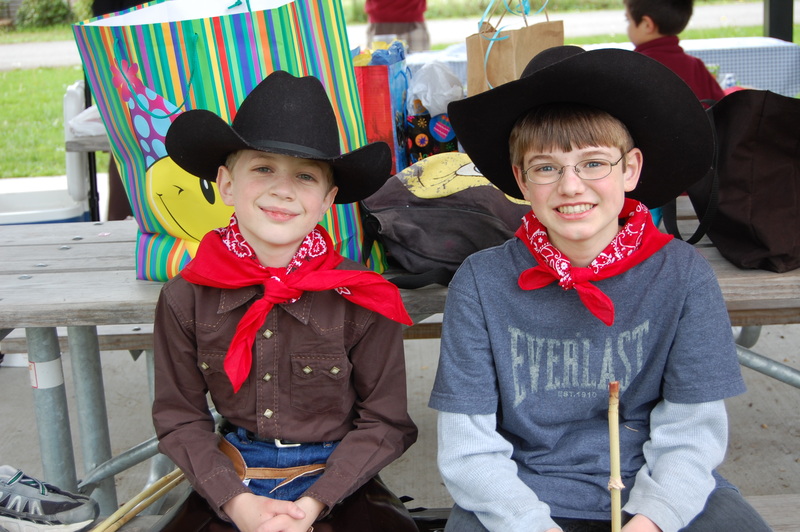 He told me it was a few years ago when I told him to dress for spirit day… he showed up to school in cowboy attire, from boots to chaps to belt, bandana and the hat – only to find out it wasn’t spirit day… nor was it spirit week. I remember the day well. I drove up to the school end of day. Marching up to the car he swung open the door, plopped onto the seat, slammed the door hard and announced “I HATE SPIRIT WEEK! !” Making my way out of the Mom’s Day event, I stopped to tell the school “Mother” about this incident. It took her a bit to contain the howling, snorting doubled over laughter – catching her breath she said she remembers that day. One of the teachers came by to ask her why Henry wore cowboy clothes to school. “I don’t know. I guess he likes to wear chaps and boots. I wonder if he remembers he attends a school with uniforms.” The kids and I realized, laughing hysterically as we poured over the year book that we really missed having College Girl home this year. Didn’t realize how much she had helped our entire family keep our details straight. I’m jarred into the moment with a shrillness of a blaring fire alarm. Holding my ears, I rush through the kitchen, switch the burner off, grab billowing pan off stove, rush toward the back door to the deck. This is not a rare event. It’s at least a weekly one. I can’t say I hate cooking. I just like to cook occasionally. I won’t say I’m a pyromaniac, no that’s not it. I’d rather say I love to learn and think and write, and kids and husbands have to eat so often. If I’m ever to think deeply, put something down in writing, struggle over an idea, it will get in the way of cooking. So when I found this sign, I decided to proudly post the truth:) The sign is me, not only because I can be forgetful about meals themselves, but because I’m lacking nothing in the way of hugs and kisses to whatever kid or husband will take them! For the record, our fridge is always stocked with pre-made salad I put together, a pot of chili, home made bread (that’s Adored Husbands nightly ritual), nut and crasin packs, pre-boiled eggs, often a pot of soup. The freezer almost always has pre-made smoothies, corn dogs… you get the idea. It’s not that the family goes hungry. It’s just that spending 10 hours a day in the kitchen gets on my nerves. There are ideas that float around Christian Circles -opinions sent through the “A Goldy Christian Woman would …” grid. Ideas that sometimes stand my hair on end, because they are ideas, not God Speak, and dump a whole lot of guilt on people for no good reason. Ideas such as a Godly Women will set aside who she for what the family needs “for a season” until kids leave the home, because time flies by. That particular idea is partially true for families who have 2 children, two years apart. However the idea lacks any validity at all for families who have many children, or families whose children are spaced out! – And anyone who knows are kids will agree we have spaced out kids:)… (OK, the acorn doesn’t fall far from the trees – plural.) We had our first (College Boy) when I was 26. I will be 60 when Butterfly heads off to college. Thirty-four years to be exact. That’s not a season, it’s one year short of 3 and a half decades – and during my prime. I don’t ever think it’s Godly to be selfish and so centered on what I enjoy that I ignore or neglect my kids and husband, however there is a fine line between caring for my family and loosing myself. If I don’t at times write, sing, climb a mountain, think a deep thought and express it, take a photo, write some more, I’m just a walking shell – a robot Mother, not myself. I’ve tried putting me on hold for years at a time, wondering why I’d eat for pleasure rather than fuel, struggle with a sense of meaninglessness, and experience frustration at the feeling of being a failure when it comes to being a mother. To be honest, I have never been able to come close to competing when it comes to birthday party events, volunteering at school, even keeping the house straight with the world all day every day. Age has given me the gift of easy does it…, it’s becoming clear that Mom’s come in all forms – even somewhat intellectual and bookish at times. Some Moms thrive on casseroles and wrapping gifts perfectly. Some can make casseroles and wrap gifts, but the tasks drain them rather than give them a sense of accomplishment. Just as some Dads will coach their kids sports, others may teach their child how to trade stock, how to pull an engine or how to think about Western Civilization. People are unique… that’s Mothers, too. When I embrace who I am, my children start to embrace who they are, their sense of value further develops, they become better servants, care for others on a deeper level by the development of their own esteem. Okay, I shouldn’t be burning up dinner once a week. This is true. The important thing is that no matter what has me deep in thought, I’ll not run out of hugs and kisses – well, not permanently, anyway:) My family might survive on peanut butter and jelly a long time, but wouldn’t last long without love. If you don’t believe in ADHD, come follow me around for a day or two. I will make you a believer. I don’t mean to be random, I just am. I spent a lot of my life thinking I was stupid. Wondering why I couldn’t hear a word spoken, busy with a thought far away from whatever was being said around me. Couldn’t sit still. Sitting in the tortured stillness of church or school impossible unless I distracted myself by bumping my knee up and down, relentlessly doodling or standing up intermittently and pacing at the back of the room. Or the forever late problem. Loosing friends because of being late, forgetting what I said I’d bring, or forgetting altogether that I would be meeting them. Getting lost going places I’ve been dozens of times. Loosing things. Paying bills late with plenty of money in the bank. Having no idea it’s picture day for my kids because I didn’t remember they bring a backpack home, let alone remember to read the papers in their backpack. Not remember its chapel day although it’s the same day every week every school year. Not remembering names. Not remembering to make lunches though kids eat lunch five days a week – I can’t tell you how many times I’ve been called by the school saying my child has no lunch at all. Not remembering to set my alarm. Forgetting to buy groceries although we eat all the time. When I do remember, carefully making a list, placing it in my pocket, having no idea about looking at a list when I get to the store, never thinking once that I might have a pocket – wondering around the store, no rhyme or reason, without a clue as to what is needed at home. Showing up with items we already have a dozen of. I am not kidding. Ask friends who have come to visit. I have at any given time 3 to 5 open mayonnaise, mustard, milk, peanut butter, jelly, butter, salad dressing and applesauce containers in our fridge. See, folks with ADHD overjoyed with life and embracing the moment have lots of kids, and sometimes their kids have the same challenges. Therefore the problem is compounded as many times as the children that live like their random parent. There is no way to fake this problem. One day at work I walked the nearly ½ mile in distance from our office to the cafeteria, got myself some salad, put it in a takeout container, set my clip board and phone atop the lid and walked the ½ mile down halls, up stairs, along the very long hall, a turn, more never-ending hallways, the code punched in, through the open door to finish the long walk down another long hallway to the office. Once through my office door I set my salad and clip board down, plopped into my chair and started nibbling at my yummy salad while working on a chart on my PC. A few minutes later my thoughts were disturbed by a loud knock on the door. I walked over to open, and there stood three security guards with very pale and frightened faces. “Are you alright?” one stammered? “What?” I asked. They pointed to the floor where there was a trail of deep red blood starting at my door and going down as far as I could see. The guards said it started at the cafeteria. They wondered what in the world had happened. I glanced down. From middle of my shirt to the bottom of my white pants was a wash of red. The guards saw it too, and almost looked panicked. Laughter. Laughter until tears were flowing down my face. Doubled over, howling, gasping for air. No way to talk through the gasps. I walked the guys over to my desk and opened the lid of my salad. Beets. Lots of them. Now this could maybe happen to others that have no ADHD, but I have these situations constantly. No two incidences are the same. Just two weeks ago I was on a trip with my husband and kids. I went to the local drug store to fill my ADHD meds. The pharmacist said it would be 10 minutes or so. I wondered around with the kids. About 10 minutes later the pharmacist tracked me down in the store, held up some keys, asking me if they were mine. Of course they were. I would have been in such a mess if I’d lost them because they were the only set for our rental car , and of course my phone was dead, couldn’t call my husband, and he had no car to pick me up. I had the car. The pharmacist had a bit of a smirk on his face when he told me that he could see I needed my ADHD meds. Many people don’t understand that ADHD is not, first of all, a kids disorder, and secondly, a disorder created by ‘the drug companies’. There are so many misconceptions about ADHD. Many think it’s a descriptor of a person who cannot concentrate. WRONG. The brain wiring causes hyper-focus, which prevents focusing on the moment, the task needed attending to at hand. Forever there has been concessions made for men with these characteristics. The Mad Scientist and the Absentminded Professor. People will talk about how men are not able to multitask like women. There have been no allowance in culture for a women with these same characteristics. I am all woman and can not multitask at all. And even for men, comments have been often heard such as “He sure thinks he’s smart… that college education and all, but not a lick of common sense”. Now that there are advanced ways for measuring exactly what is going on in a persons brain that has this make-up, it is known that what is happening in a brain with ADHD is radically different from a person without ADHD. At last there is no denying the disorder is real, unless one has no regard for basic science. Yes, there can be dozens of other causes for the symptoms mentioned, however when those many reasons have been ruled out, meeting all criteria for the diagnosis and can effectively be treated with medication, coaching and understanding, the diagnosis can positively change a persons life and future. I wasn’t diagnosed until my 40’s when our son was evaluated and diagnosed. This happens often. A parent seeks answers and treatment for a child facing challenges that are limiting their ability to win in life, and ta-da – Mom or Dad have the condition, too. It has a strong genetic component. My scattered state has seriously affected our son who needed badly for Mom to help him order his life so that he could have a little hope with brain wiring that was causing him to not live up to his potential. My chaos has caused pain to our other children, and pain to our marriage. Everyone needs predictability and order. Lack of order does damage. Most of us with ADHD marry someone as opposite and ridged as God makes em. This, you can imagine, creates a lot of fun, and a lot of pain for both, and generous portions of shame for the always confused one – having a desire to be the most amazing husband or wife ever, and yet forever failing. Don’t misunderstand. A person with ADHD can transform the house into a work of art, cook an amazing meal, and can pay bills, they just have major difficulty sustaining these activities for any length of time. And if they do those three things right three days in a row, they will completely miss other very important things like locking the door at night, feeding the pet, getting a cavity filled, or putting the washed clothes from the washer to the dryer in the same day. If the spouse becomes the one who reminds, they become a sort of parent, and there is no attraction in that… who wants a romantic relationship with your Dad or Mom? YUCK! So the challenge is taking on these impossibilities yourself, maybe with the help of a coach, but not expecting your spouse to pick up the slack for you. Choose to forgive your spouse for anger they feel regarding unmet expectations. Own what is yours, stay vulnerable, yet never allow any kind of emotional abuse from your spouse (put downs, derogatory comments, taking control, minimizing your freedoms, etc..) even though you have provided an easy target for your spouse to justify their negativity regarding you. Grieve for your unmet expectations of being able to live a bit more free and spontaneous. Work at respecting your spouses’ needs without being the one to meet every last one, setting yourself up for failure and he or she up for dependency. Your spouses natural internal stability and rhythm can be a great benefit to you if both of you are respectful and want to see each other win in life. The best part of being ADHD is that life is never boring. If one never runs out of gas, one never get to explore out of the way towns, meet helpful people, and is never necessarily grateful for the seemly insignificant blessings like the times one hasn’t run out of gas. Really, I only need to watch a few movies in my life, because they are brand new for me every time, even for the 35th time. I know who my real friends are. The fragile sort who can’t take my constant forgetfulness and have me pegged as a thoughtless flake last about a week and are gone. The ones I have long term know they are truly loved by me in ways that may not be conventional, but are signals of love nonetheless. ADHD allows me to think about an idea and go deep with what I’m thinking about. Allows me to look at things through different lenses. My life is a dance, a song, a twirl, a twist. It’s an amazing collection of challenges. I’m lucky I have ADHD. Glad I have plenty to laugh at myself about. What would life be like to do it all perfectly, with one rare mess up, the complete and total undoing of my image. That would be painful. Life is getting easier. The more grace I receive from others, and grace I give myself, the less impossible creating some pockets of order has become. Routine is the key for me. But very flexible routine. If I find a system for laundry that works, but can’t get it done the day I choose for laundry day, I use the same routine the day I’m able to take the task on. That sounds like daahhhhhh for most people, but for me it has been a brand new and exciting realization. Less works better for me. I provide myself giant margins in my life. We don’t have our kids in sports, music, AWANA, Scouts, anything but school and church. I’m not in choir, singing for a big band, in a women’s Bible Study, or on any boards. We’ve done those before throughout the years, and will return to them once I get past the complications of this breast cancer, but I have to keep sanity, connectedness, stories, listening, and a crazy slow pace at the top to manage life. When we do add in activities again, it’s one at a time for each of us. I use alarms many times a day. I even put my list on my phone alarm. Like set the alarm so that when I think I’m going to be at the grocery store it will go off and remind me to remember I have a pocket with a list in it that I need to look at. Our trunk is continually being filled with bags of give away. The more stuff there is to manage, the more difficult life is. I have friends that give me ideas, that sometimes help me organize, that help me catch up on life. Friends that know me and my mess and love me anyway. If you struggle with any of these symptoms, go find a doctor who has respect and a broad understanding of Adult ADHD and ask to be evaluated. If you don’t struggle with these challenges, love your friends and family that do. And if you’re not a believer in ADHD, come on over. If you still don’t believe, I’m sorry to inform you that you have a different disorder called PAHTHSLDFAE – People Always Have To Have Some Lame Diagnosis For An Excuse – also refereed to as AAKD (Arrogant All-knowing Dweebs).